Metallics are an easy way to add a little glam to a rather ordinary outfit. I paired this metallic knit with an all white makeshift short suit and red accessories for a bold pop. I love how easily it can be dressed down too! By simply switching out the ankle strap pumps with gladiator sandals and a beach tote. Also how great is this La Mer watch? It's a watch and arm party in one! Such an effortless and easy accessory to throw on this summer while still looking pulled together. This outfit is part of the East vs. West Challenge series i've been doing with these blogger babes: Jackie from Living After Midnight, Jessica from My Style Vita, Tracy from The Right Shoes, Ashley from Pursuit of Shoes and Rebecca from Oomph. This week we're showing you how to style a favorite trend of mine, metallics. 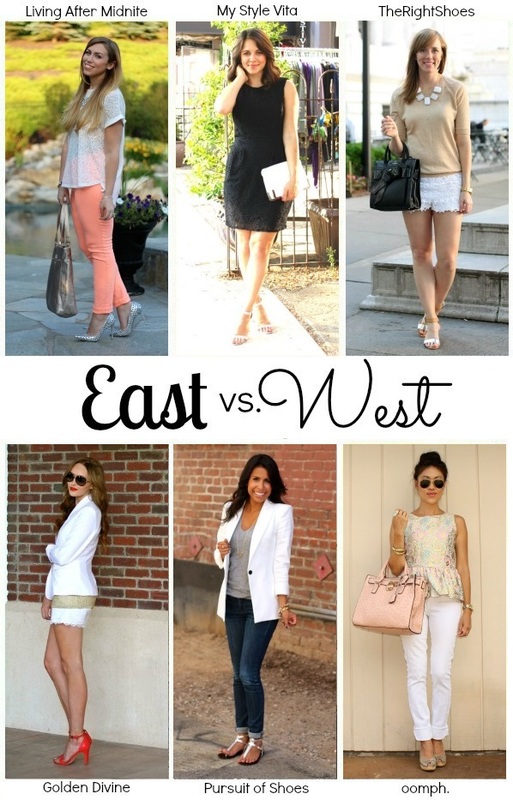 Check out each of their blogs to see how they each styled this summer trend! If you missed the previous posts to this series, you can see how we styled nautical stripes & denim shorts. Love that you essentially created a white suit!!! So chic!!! Love how all of our looks this week were totally different! Woman, you have the most gorgeous legs! Love the color palette here - gold, red and white?! Amazing! Love your classic style! i love how your lips and shoes just pop! i have been loving white lately...such a pretty sweater! This is so gorgeous! Your top sort of has a chain mail look, which I love. Great recreating the Short Suit look which is trending this summer. The heels and arm accessories are just right ! !